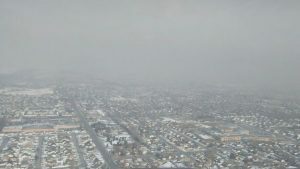 When we arrived in Salt Lake City three weeks ago, the region was in the middle of an inversion event. This was great for the start of our research project because we were able to immediately start using our 80 allotted flight hours. To keep track of our hours and how the project is progressing, we use a “McFadden Plot” (see picture). Essentially, if we progress along the 1:1 line from left to right, we will end the project on schedule having used all of our flight hours. 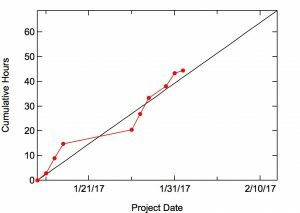 If we are above the line, we’re on track to finish early but if we are below the line, we won’t get all our flight hours completed before the project end date (yes, this can happen). We were happy with our status after the first three days. 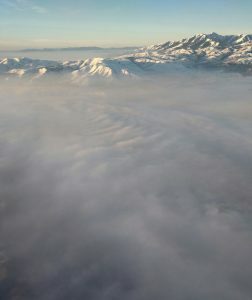 Then came the end of the inversion on 1/19. 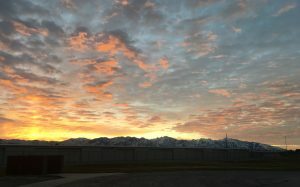 Typically, the breakup of an inversion event is triggered when a storm moves through the area and brings wind and snow/ rain that clears the air by blowing the pollution out of the valleys or depositing particles to the surface. Our first inversion event was no different. A storm dumped snow in all three valleys and the folks at the ground sites in Cache Valley even had to dig out the doors to their instrument trailers. Unfortunately for us, that meant…no flying. Even though we would like to know more about the chemistry during snow storms, our instruments would not like sampling water through our inlets. So we waited out the storm the best we could. 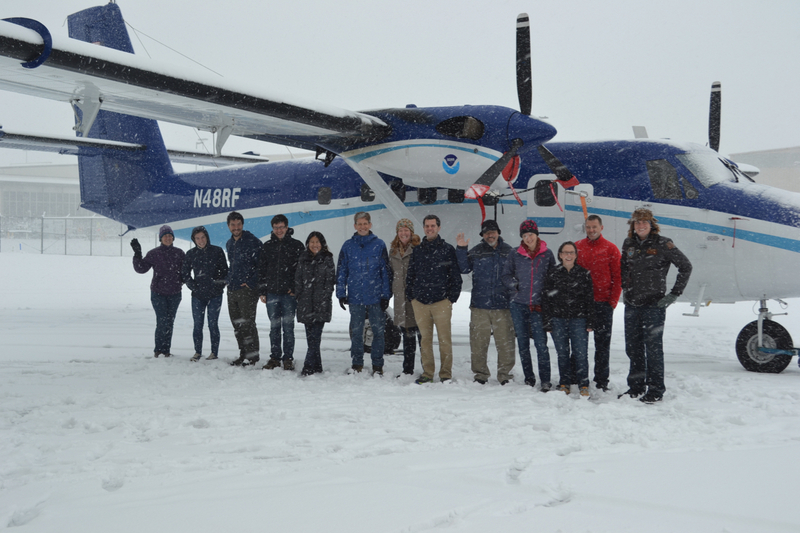 We even took a group photo while the majority of scientists working on the project were in town (below). 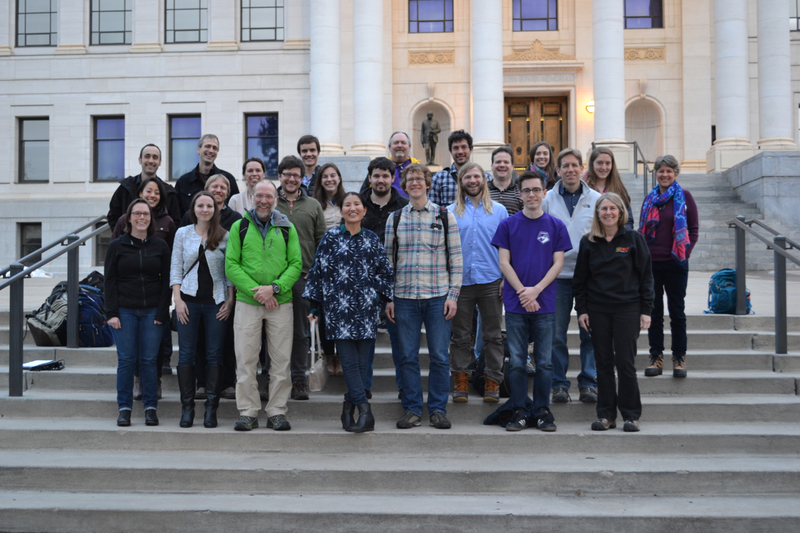 We passed the time by calibrating our instruments (and troubleshooting when things didn’t work they way they should) and holding a science meeting at the University of Utah where we met many of the researchers from other universities and institutions who are working at the ground sites (see below). Having meetings in the middle of a campaign is actually quite helpful because it forces you to spend some time looking at your own data to make sure everything is working properly. We are starting to get a sense for the emissions and chemistry in this region, which has never before been studied by aircraft. We also got insight from the local researchers into some of the emissions sources. But then we waited… and waited… and waited. Finally, after 8 days without flying and falling well below our 1:1 line (right), the weather cleared enough for us to fly again. We wanted to complete few flights during “clean” conditions before the next inversion for comparison but the second inversion started very quickly after the storms passed through, not leaving us much opportunity. 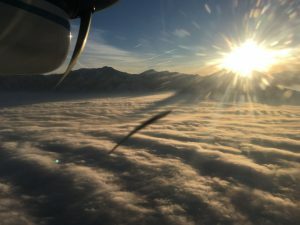 We continued to fly when we could but the second inversion event was much stronger than the first and had dense clouds and fog associated with it. 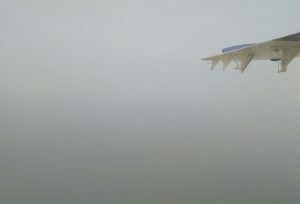 By law, flying is limited by the height of the clouds and visibility range, which meant that there were some days where we could not fly even though the chemistry was interesting (see pictures below). Over Great Salt Lake. Fog, clouds, or pollution? Despite these challenging conditions, we were doing well and on track until we hit a major, non-weather related setback. During one of our missed approaches we hit a bird. Although the integrity of the plane wasn’t compromised (hats off to our excellent pilots! ), it still took 4 days for the damaged area to be epoxied and repainted . But the mechanics did a great job; you can’t even tell that anything happened (left). After that maintenance period, we had to wait out the wind and the rain from the storm system that had cleared out the second inversion. All combined, weather and maintenance kept us on the ground for 7 more days. 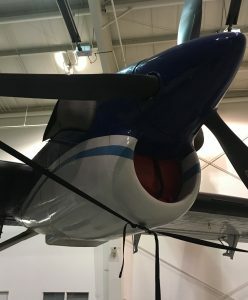 On top of trying to schedule flights during the morning, afternoon, and evening hours both during inversion and non-inversion conditions and balancing pilot rest requirements, these delay highlight the fact that the logistics of pulling off an aircraft research project are quite difficult! I’m happy to report that we are back to flying as I am writing this and have transitioned onto a night schedule while we attempt some pre-sunrise flights to help us recover and get back to the 1:1 line.